As a concerned and experienced pet owner, I have studied, tested and sold pet foods. I was a distributor of Veterinarian Formulated Complete pet foods during the 90‘s throughout the Gulf States of LA, MS, AL and FL. I have acquired hands-on experience with quality, effectiveness of premium pet food diets and marketability. What I am going to share with you might be surprising, but it is important for the wellbeing of our pets and the overall cost that is involved to achieve this. Dogs and cats are primarily carnivorous by nature. This means they require fresh animal proteins and fats in their diets. Many pet foods today use supplemental grain and vegetable proteins in their formulation. They are found as ingredients such as soy meal, soy gluten meal, corn gluten, wheat gluten, etc… These are excellent proteins for you and I, but not so for dogs and cats. The basic problems with animal proteins and fats are the cost of these ingredients, the quality of meat rendering and the cost limitations to preserve them. Preservatives and proteins are the most expensive ingredients in pet foods. This motivates many pet food manufacturers to supplement with less expensive ingredients to remain competitive, while misleading the consumer. In 1909 the AAFCO, Association of American Feed Control Officials was established. They developed standards for pet food safety that has to be met and documented by way of labels on each pet food container, by every pet food manufacturer in the USA. You can now find the guaranteed analysis and ingredients listed in order of concentration on every container of pet food marketed in America. One of the standards for dry kibble was an expiration date. At that time, very strong and effective synthetic chemical preservatives were being use. These chemical preservatives include ethoxyquin, BHA, BTH, and TBHQ. These preservatives maintained a fair amount of the protein and fat quality for up to 18 months in normal storage conditions. This 18 month expiration became the industry standard. As pet food sales became competitive and the realization of the hazards of these synthetic preservatives (primarily ethoxyquin), natural preservatives were developed and utilized. These healthier preservatives, known as mixed tocopherols (vitamin E), citric acid (vitamin C) and rosemary, are commercially considered superior due to there better marketability, but are much less effective in preserving animal fats due to their rapid decomposition rates. If pet foods preserved with these natural antioxidants are stored in warehouses that exceed 80 degrees Fahrenheit, they will start to decompose in as little as three months. The average age of pet food purchased in stores today is 6 months of age. Consumers assume this is safe and even considered fresh because if purchased at six months of age, it expires in one year from purchase. The fact is, it is already loosing nutritional value as fats are oxidizing and becoming rancid. This misleading expiration, in my assessment, is the greatest failure in the safe regulations developed by the AAFCO. These expired products can maintain your pet, but at the cost of their health. These “less nutritional” foods cause greater volumes of consumption, decreased digestive efficiency and possible health issues, all with increased cost to you. These innocent pets are forced to eat what we provide. Our dogs and cats require and deserve better! There are many so-called premium pet foods available in stores today but unfortunately, they are all lacking the same primary essential requirement, freshness! One company is rewriting the way pet foods are produced and delivered. With the guidance of one of our nations leading nutritionalist, Dr. Jane Bicks DVM, a product named Life’s Abundance was developed. This formulation has been developed into the highest quality pet food product commercially available. This product is not found in stores but is delivered to your door fresh each month, usually in less than six weeks from production. It is superior to any other pet food with the necessary combination of ingredients. This eliminates the uncertainty of expiration, and guarantees consistent, fresh nutrients delivered to your pets at every feeding. Our pets can no longer forage for what their bodies need, nor can they tell us what they need, therefore they are totally dependent on us to provide their nutrition. Three years ago, we switched our Siberian cats diet to Life’s Abundance. Prior to this we were feeding other Premium cat foods and supplementing their diet with vitamins, fresh raw chicken livers, gizzards, and hearts. Our breeding program was doing well as we produced 4-6 kittens per litter with low mortality rates. This is slightly higher than the national average of Siberian litters of 3-4 kittens per litter. We were reluctant to switch at first due to the shipping cost, not considering the cost of our time and shopping travel expenses. Since we switched to Life’s Abundance we noticed a decrease in food consumption, increased litter size (4-10 kittens per litter, with an average of 7 per litter) and virtually no mortalities. All our cats appeared healthier and our litter boxes stayed cleaner longer. 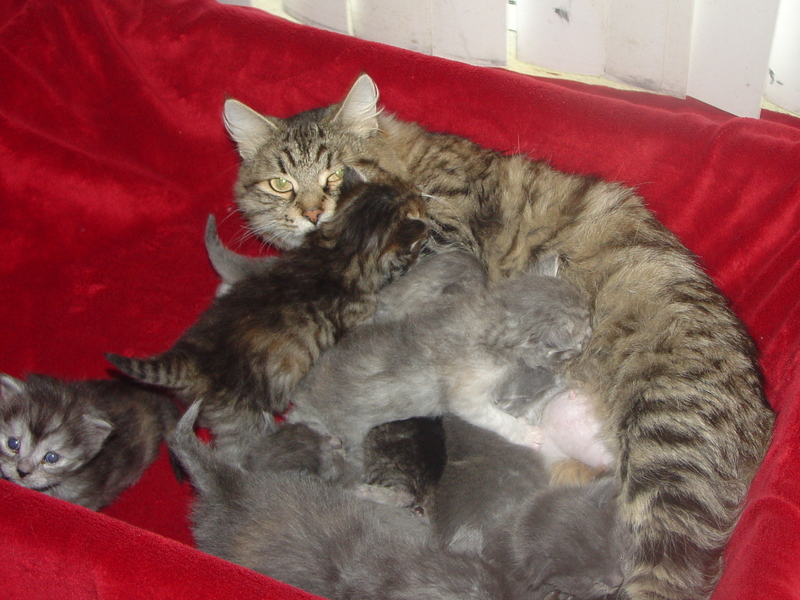 On Christmas Day 2012, one of our Siberian Queens gave birth to 10 beautiful Siberian kittens. This is unheard of with the Siberian Cat breed. All kittens are thriving and are in the process of being relocated to their new homes. I sleep better at night knowing I am giving my dogs and cats the very best pet diet available today. I indorse this product with the upmost confidence. Please click this link- Life’s Abundance to learn more. You can compare Life’s Abundance to the product you are presently using and to other store bought brands then decide for yourself, but most important is to do it for your pet. I recommend this diet to all my customers and actually receive small commissions for sales that result from my recommendations. This is a win-win situation with additional bonuses. Our pets receive the very best, and we receive peace of mind, not to mention one less shopping chore. In addition to saving money, I get to indorse the very best formula available today and get paid to do it. I believe this to be a win-win-win-win-win-win situation. OK, I’m gloating, but this information is too good to keep a secret. Share this information with your friends and family. This company thrives on word of mouth advertisement and in exchange, our pets thrive on the superior fresh nutrients they deliver. Our pets deserve it! I value Daniel Daigle’s advice and opinion very much and am sure that this diet is the best…but unfortunately I cannot find this pet food in Canada. …If ever it becomes available I will for sure buy it for my Siberians!! I adopted 2 wonderful Siberians from Svetdanhaus Siberians in December 1012 and they are amazing and beautiful! I am so happy that I met Daniel. He has truly educated me about Siberians and the diets of cats and dogs. I just switched my dogs food to Life’s Abundance and they love it!!! It has been about 5 days since I switched food and I can already see a difference, both with the amount I feed them and how it’s working in their system. No stinky dog farts, like the old food produced. I ordered online and two days later it was at my home. Another great feature is the auto ship. I select the products I want auto shipped, set the frequency and that’s it…delivered to my door. I also purchased the hard and soft food for my sweet kittens, who will be coming Monday, 3/25. Since that is the food Daniel raises his cats on, I am assured that I will be continuing the same, proper diet that my Siberians will require. I am confident in Daniel’s recommendation of Life’s Abundance. Thanks for everything Daniel and I can’t wait to meet my girls!!! I know you never heard me say that! That’s going to make things a lot eaiser from here on out. A little rationality lifts the quality of the debate here. Thanks for coutiibntrng! As a Naturopathic Physician, I couldn’t agree more with this nutritional approach. Human and animal bodies alike recognize and absorb nutrients much better from ‘whole’ foods. We thrive on foods that are unrefined and as close to how they exist in nature – free of additives, preservatives, coloring agents and other chemicals. I am choosing to feed my Siberain a grain-free raw food diet and am also interested in exploring Life’s Abundance. Thanks for making this available, Daniel. My kitty Bill loves a belly rub too, and since he was once a fat boy, he has a little satmoch pouch that sticks out. He is the most loving of the cats, and will let me cuddle with him for hours. Not shy, that one. This article is a great help to me and for my loved cats! I will order this food today.Thank you! Since this article, I have checked the expiration date on pet foods at big retail stores that specialize in pet products. Nothing found fresher than four months old, most dry foods were six to eight months old. I also checked at my Veterinarians office. The food there was also more than five months old. I have smelled my dog food become stale just days after I opened the bag. It smelled like stale potato chips. Did not realize this degraded nutrition and that my dog had to eat only what I provided. Thanks for this information, will investigate the product you recommend. great internet internet site. lots of helpful details below. i’m sending it to some buddies ans also sharing in delicious. and naturally, thanks with your energy! Hi there, I’d like to subscribe for this webpage to get most up-to-date updates, thus exactly where can i do it please assist. Excellent points once and for all, you only gotten the emblem brand new reader. Just what might you advocate relating to your put up that you choose to created couple of days previously? Every confident? What beautiful dogs 7 kiittes HALO & Mimi and Freekibble have saved I FINALLY signed up for a daily email reminder to answer the quick question and contribute my cup of kibble a day to the cause I feel like such a lazy dog (excuse the expression) for not having done this sooner. Please everyone sign up it’s quick, easy, free and clearly makes a huge difference to keeping shelter pets fed and in the case of HALO, fed very well. Your story was really inrfomative, thanks! Insightful material you have here. I did a write up myself on this theme some time ago, and I wish I had your blog as a source back then. Oh well. Thanks again for this content. Hello , I met u at the airport in Baton Rouge while shipping my dachshund puppy . I will look into your informative site about food and other interesting subjects.